Hundreds of elderly, widows, single women and differently-abled persons from different districts of Jharkhand gathered near the Raj Bhavan in Ranchi for a public hearing organized by the Jharkhand Right to Food Campaign and Pension Parishad demanding the right to universal social security pensions ahead of World Elderly Day on October 1. 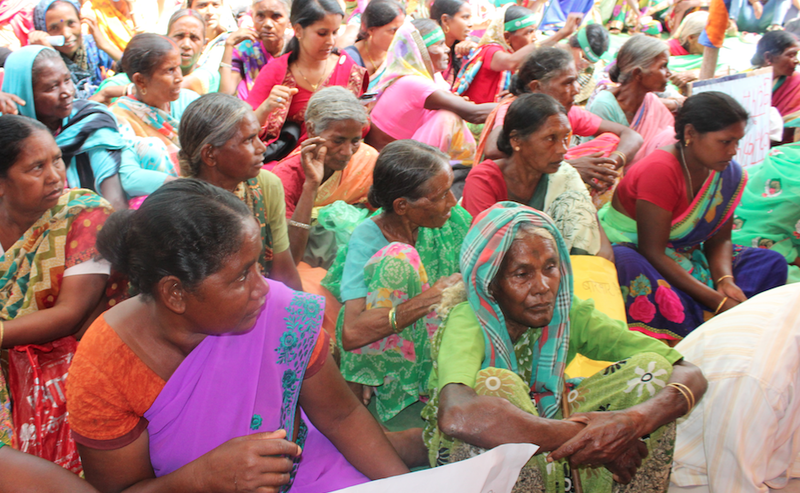 Resolving to observe September 28 as the National Action Day on Starvation Death, the public hearing marked the first death anniversary of Simdega’s 11-year-old school girl Santoshi Kumari, who died of hunger. Her family’s ration-card was cancelled as it was not linked to aadhaar. Her last words crying for rice are said to be “bhaat, bhaat”. 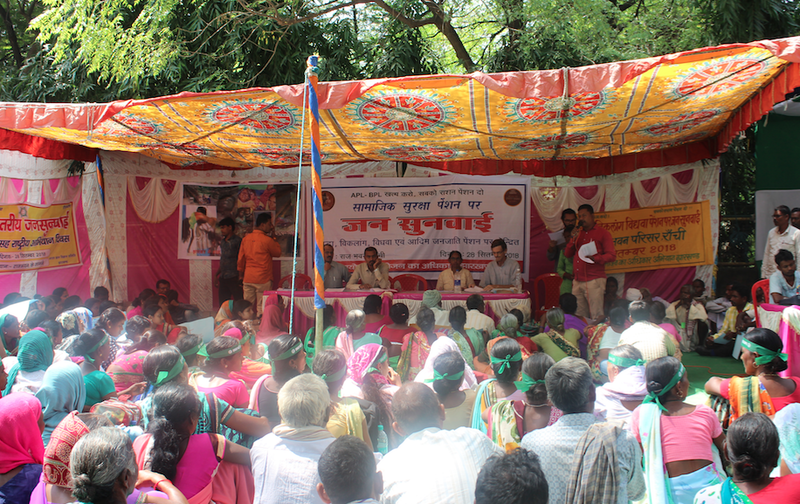 The public hearing panelists included Balram (Right to Food Campaign), Shadab Ansari (Human Rights Law Network) and Binny Azad (Ekal Nari Shakti Sanghatam). The oral and written testimonies presented by the participants sought to throw light on the “havoc” created by pensions. Several of them complained that people who are not identified as below-the-poverty line (BPL) or earn more than a measly Rs 875 a month in rural areas are not eligible for most state social pensions. 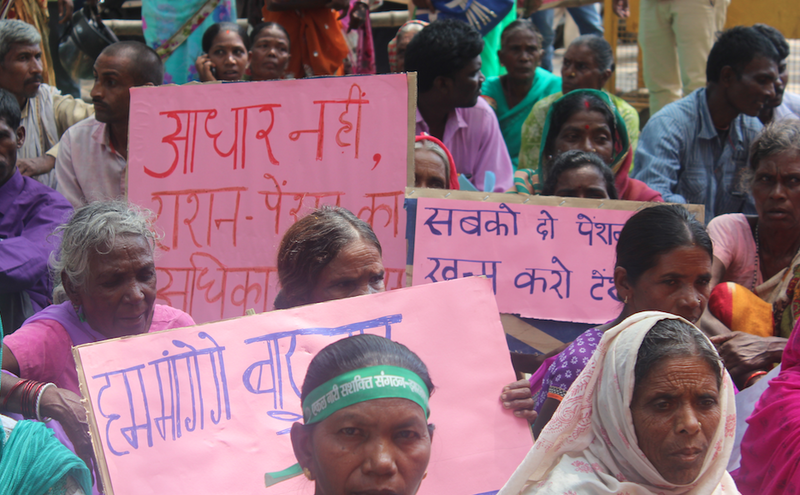 Further, it was pointed out, at least five cases of starvation deaths in the last one year alone in Jharkhand can be attributed to the mandatory imposition of aadhaar. In some cases, the pension amount was credited to the wrong account while in others there were aadhaar authentication failures. The main demands put forward at the hearing were – implementation of universal pensions, removal of mandatory imposition of aadhaar, timely payment without delays, an inflation-indexed increase in the pension amount to at least Rs 2000 per month and reducing the eligibility age, and all political parties must include these demands in their election manifestos.